I have been describing the meaning of a hashtag professionally for 7 years. You’re probably thinking I fly kites for a living. The reality of it is this: a fundamental understanding of correct hashtagging is not something to take lightly if you want to seriously contend in social media these days. [-_-]~~~ Pssst. No time to read a 16 minute article? Get the most important points of this article into your brain in 2 minutes – watch the video below now, and come back when you have time to finish reading. If you begin to think about the amount of digital media being published on the internet from any Canadian city at any given moment, you quickly realize how difficult it can be to stand out. While standing out of the crowd for the right reasons may always seem like a good thing, its not always the only smart solution. Sometimes you simply need to stand in the crowd, and speak to the right people. Hashtags can help with that. This post is not a drawn out textbook explanation of Hashtags. I’ve deliberately chosen a ‘less rigid’ style for explaining the new-and-improved pound sign (patent pending) . I believe that there is also a sense of whimsy and effervescence to the whole Hashtag phenomena, and I want that spirit to shine bright while you read. 1. What is a Hashtag? In the first few years of working in social media and digital marketing, I discovered an easy method for describing Hashtags to people who’s only interaction with one was during tic tac toe. I’m not saying that’s you by any means, but I’m going to use that same method today. Think of a Hashtag. Let’s use #realestate for the sake of this example. Now, picture it as a label on a bucket. Yes, a regular metal bucket with a label that says #realestate on it. On a big field marked “Twitter”. Now imagine every single tweet and morsel of content that is being published with the #realestate Hashtag is going into that bucket. It’s a magic bucket that never fills up. You can pick up it’s contents and interact with them and their owners, but they don’t belong to you. Now imagine looking left and right, and seeing endless rows of these buckets. Each one with a different label on them. They are all collecting newly published content from all over the planet, live and automatically. You look even further and see different fields.. Facebook, Instagram, Tumblr, and more… each with their own rows of (usually the same) buckets. Now imagine looking behind you, and seeing new buckets being placed, with only one or a few tweets in them. These buckets have brand new labels on them. Some of these buckets will be used more than others. Regardless, all of the buckets will represent a specific category. You look between the buckets, and see a bunch of tweets and media bits strewn about the ground. You can not identify them – they are unorganized and they too keep piling up. These are the published posts that have no Hashtags associated with them. They are scattered throughout the infinity of cyberspace, never to be found again. Buckets of order amidst chaos. Sadly, storytime is over. Try to apply the bucket principle to the digital concept of Hashtags now. If you click on a Hashtag (usually they are linked), it will take you to the “bucket” for that Hashtag. In other words, it will take you to a results page where you can then peruse and engage with all the other public content on twitter or instagram that has been tagged with #realestate – in chronological order. All of this to say that Hashtags are a way of categorizing and filing your published media. Often times, popular Hashtags include locations, such as #vancouver. Others focus on news topics #bcpoli. Some are just for fun and engagement, like #throwbackthursday or #ninjasdoitbetter. Sometimes people use Hashtags to convey their emotions or current spiritual state #bliss #grateful #icanteven. Most often though, people use Hashtags to describe what they are eating #taco #margarita #spicy #nom. But what’s more important than who is posting to these categories is: who is viewing them? My friend Emily often browses food-related Hashtags on Instagram, looking for inspiration for her meals. I know for a fact that she was browsing the #quesadilla category the other week. When she finds something she likes, she will usually check out more photos from that user and follow them if they appeal to her general taste. Emily is also a trained cook who loves making amazing food at home. If you’re selling beautiful kitchen knives for home-chefs, you want to find out how to put your content in front of people like Emily. She was not searching for Hashtags like #knife or #chef. So you shouldn’t publish content under those categories (necessarily). When was the last time someone bought a knife on Instagram anyways? Aim for relevant engagement, and you will achieve relevant leads. This is particularly true when talking about social media marketing for real estate agents. Which leads me to our next point. 2. Why are Hashtags important to REALTORS®? One of the most popular topics on social media is food. After years of speculating, my best guess as to why we have an infatuation with sharing and liking food media is this: eating is a primal, human activity. Hunting or foraging, preparing a meal, consuming it, sharing it… In fact, some argue that the action of cooking food is what truly makes us human, as no other species does. This is an experience we can all relate to, across cultures and countries – and across social media networks. Another similar human connection we share is community. We are all part of a country, a city or town, an island, a campsite, a commune, even a street corner. Almost all of us – poor and rich – lay our heads down somewhere knowing there are others not too far away. We are all part of a community, one way or another. We eat at it’s restaurants, walk on it’s sidewalks, drive on it’s highways, hike in it’s hills, swim in it’s pools, learn in it’s schools, and most importantly, live in it’s neighbourhoods. Your target demographic not only is part of the community, they want to transact or own a piece of the community. Your potential residential real estate customers are commonly very excited and passionate about the neighbourhood that they are living in or moving to. They are enthusiastically engaged with the businesses in the surrounding areas, the family services in the neighbourhood, local events, parks and recreation facilities, local news, public figures and more – both online and offline. Wouldn’t it be just great if they happened to stroll upon your awesome community posts while having a high-spirited leisurely browse through #yourcityhere? Just like the knife salesman might target Emily’s leisurely food browsing, you could target your potential customers’ leisurely community browsing. And most importantly, remain relevant to your brand while doing so. Every REALTOR® represents a community. To answer the original question posed in the heading above, Hashtags are important to real estate agents because they give you a direct line into your community. A place where you can build your brand through a series of pleasant interactions with other community members and leaders. The Hashtag #vancouver contains 7.1 Million posts on Instagram. #calgary contains 1.5 Million. #toronto contains 14.8 Million. These are very active Hashtags, and are an amazing sort of place to begin engaging and building relationships with your potential future customers. I invite you to dig deeper into your own community and do some instagram Hashtag searches yourself on Iconosquare or twitter Hashtag searches on search.twitter.com. 3. Where are Hashtags effective? A good Hashtag strategy is more vital on some social media networks than others. Hashtags became popular on twitter originally, and due to the massive rise in their popularity, they have been adapted to other social networks since then. These days you can use Hashtags on popular social media channels such as Facebook as well. They will function the exact same way that they do on Twitter, but they just don’t make as much impact. Other sites have their own methods of categorizing, such as YouTube or Pinterest. They didn’t bother adopting the Hashtag for their own reasons. Point is, every (popular) social media channel provides you with a way to categorize content. Instagram also very successfully implemented Hashtags into their platform. They are the perfect way to organize all the photos stored in the app from the 400 million daily users. I would highly recommend using Hashtags primarily on Instagram and Twitter. The question of “Where”, however, is a two-layered question. The first layer addresses which social network, then there is the second layer that addresses placement of actual hashtags. This leads us to our fourth and final section. And perhaps the most important. 4. How to use Real Estate Hashtags. In the previous sections, I mainly focused on the benefits of sharing your content with relevant Hashtags. Mainly relevant community Hashtags. This section is going to go full-ninja. Yes, the benefits of consistently using #westvancouver when publishing content are substantial, if you’re a real estate agent serving that community. However, people are selfish and social media is to some degree narcissism. When you embrace these facts as true, you can unlock the true potential of all Hashtags. Charlotte, the potential real estate customer, posts an Instagram of her dog Ruby on the Seawall in West Vancouver. She includes #westvancouver #dogsofinstagram #sunset and a couple other Hashtags in the description of her post. She decides to also automatically send that post to her linked twitter account. David, the local REALTOR®, is perusing the #westvancouver “bucket” and comes across Charlotte’s picture of Ruby. He likes the photo. Charlotte receives a notification that “@RealEstateDave” just liked her photo. Charlotte receives a notification that “@RealEstateDave” just commented on her photo. She may proceed to comment back, but at the very least she will see it. It was a well thought out comment, relevant to that photo and showing a common interest (in the West Van seawall). Now you may be thinking “Creepy”. But I beg you to reconsider. Charlotte wouldn’t have hashtagged anything if she didn’t want people seeing her photo. She also would probably have a private account, where only her approved friends could engage with her. I’m not saying everybody wants to be Insta-Famous. I’m just saying that people who are active on social media appreciate being recognized online by peers, businesses and leaders in their community. Charlotte was looking for engagement and she was happy to receive it. And she’s not the only one. Social media brings people with common connections closer through genuine interactions over long distances. Be a part of peoples’ daily hours spent on social media by leveraging Hashtags the right way. This will also draw more and more eyes to your account, be it twitter, instagram, or any other social network. The nature of engaging, and in return being engaged with, is naturally flowing through the biology of social media as a concept. Some social media networks just give you better ways to access the right content through Hashtags. Now, that we’ve covered social media engagement as a product of content discovery via Hashtag, comes the question of where Charlotte actually placed her Hashtags when publishing her post (this is what I was getting at at the end of section 3). It’s a bit different depending on whether we’re talking about instagram or twitter. On instagram, you have two options: A) Place your hashtags in the description of your posts (official method) and/or B) tuck your Hashtags away in the comments of your posts (ninja method). Check out the screenshot of one of my recent instagrams from Hawaii below to see both of these methods in use at once. 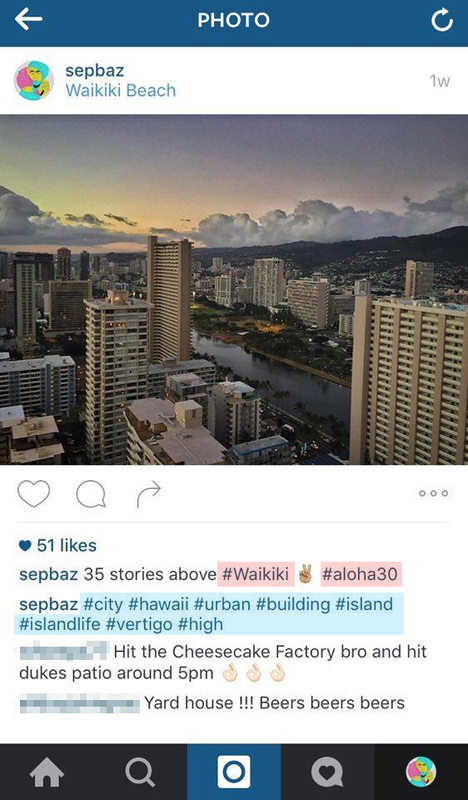 Notice the two Hashtags highlighted in red, #Waikiki and #aloha30. Those are the primary Hashtags I used in my initial photo description. Now check out the eight Hashtags highlighted in blue, #city #hawaii #urban #building #island #islandlife #vertigo #high. Those are secondary Hashtags I tucked into my comments. The main benefit of using the Ninja method or employing both methods is that you can keep your initial description clean, simple, and focused. Maybe add a couple emojis if that suits the mood. Then tuck your other 8-10 Hashtags in the comments, and aim to receive enough comments from other users that your original comment doesn’t even show up! If you’re on twitter, it’s a little bit more simple. Just add your Hashtags to the end of your tweet. Check out this screenshot of last week’s Dojo article being tweeted from the @RealtyNinja account. Be timely, stay true to your brand, and maintain relevance to the general public. Do it… Do it. People also use Hashtags on their personal profiles for fun or to be clever and witty. They will use Hashtags that they know nobody else has ever used or will care about, because it speaks to their personal brand somehow. My friends invented the word “Quesh” a couple of weeks ago and it has become a funny, ironic Hashtag that we use now. It just happens sometimes and you shouldn’t fight it. One day, @RealEstateDave was feeling funny, so he shared photos of his mediocre 1 bedroom condo listing but included Hashtags like #livethedream and #allthiscouldbeyours. When I finally read #iwishicouldaffordthis, I realized David is just being ironic and not actually using the Hashtags to describe the listing. As you can see, the adoption of charismatic Hashtagging for your professional brand can work as well. Thank you so much for reading. Hope you got something out of it that you can apply to optimizing your real estate marketing. If you have any questions, please leave them in the comments below and one of our esteemed Ninjas will get back to you! You can also always email us at info@realtyninja.com.